The Deka Fahrenheit Series of batteries beats the heat. Elevated temperatures have always been one of lead-acid battery’s more formidable foes, requiring costly cooling systems installation and constant energy demands. Along with the cost associated in purchasing and installing cooling units, there’s the continual cost and energy loss from powering these systems. Multiply that by every site, and that expense keeps growing. 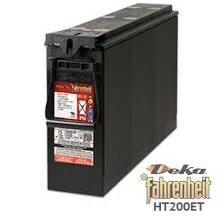 The Deka Fahrenheit™, is a revolutionary battery that will not only beat the heat, but also reduce the cost of these expensive cooling systems. A breakthrough in a heat-tolerant VRLA monobloc battery design the new Deka Fahrenheit survives up to 3 times longer in temperatures of 60°C / 140°F – far beyond the life of a normal VRLA battery. Innovative features through an Exclusive Thermal Management Technology System provide a product that significantly reduces the need for outside plant cooling systems to save considerable cost, conserve energy, and reduce the overall sites’ CO2 footprint. For better battery protection: East Penn DC Power Cabinet – a High-Temp Switchgear Cabinet that helps maintain ideal environmental conditions for your UPS system. Multiple system configurations are available for 24, 48, 125, 250-volt DC systems. The Deka Farenheit HT200ET with a heat-tolerant VRLA monobloc battery design that survives up to 3X longer in temperatures of 60°C – far beyond the life of a normal VRLA battery. With Helios™ Additive reduces float current up to 75%, enhancing high temperature life.